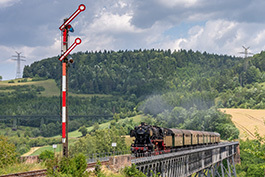 In October 2019, 50 2988 will cover several photo trains for us on the Wutachtalbahn, just like at the best DB times. Passenger trains with 3- and 4-axle passenger cars, as well as several freiht trains. Night shots, run pasts and much more.